Private pool totally heated and heated at 30 ° C all year round with SPA, integrated set in the house with direct access to the living room, secure for children by door locking. Large living room of 50 m2 including a living room with fireplace (wood available), 2 sofas, coffee table, flat screen TV, DVD player. Dining area with Norman table, bench and chairs. Bedroom 1: 13m2, 1 double bed 160 cm and 1 single bed 90 cm. Bedroom 2: 7 m2, 1 double bed 140 cm. Private relaxation area and not overlooked (electric shutters). The pool measures 8m x 3.50m. 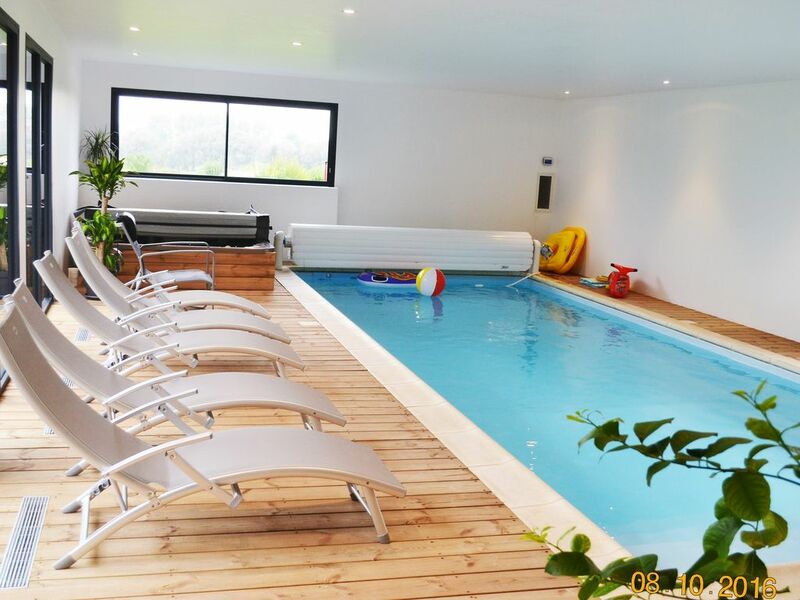 Depth of 1 m to 1.70 m.
The swimming pool and the spa are in the house, in a heated room of 80 m2, with deckchairs. 4 bay windows overlooking the garden. All bay windows have electric shutters. The swimming pool and SPA are accessible through the lounge (door locking for children's safety). This SPA has 82 jets. Included in the rental price: 1 towel / person Possibility to rent the kit for the relaxation area: 1 swimming pool towel + 1 bathrobe: 6 € per person. Beautiful and well equipped house. Spotlessly clean. Kids loved the swimming pool. Celine and Cyril were wonderful hosts and took the kids to feed the chickens and see the baby ducklings. Loved the fresh eggs and salad. Lots of play equipment to keep the family happy with the added feature of the Avenue Verte minutes from the house, ideal for bike rides and walks. On arrival we were warmly met and shown around. The first thing that stood out was how spotlessly clean it was, and well presented. The pool and Jacuzzi are just amazing and also very clean and well maintained. Our children wanted to be there all the time and have asked to return. Lots to do in this area and we visted Rouen, Dieppe, Honfleur and a great wildlife park too. There are local supermarkets and even a McDonalds if you need to appease fussy children. Don't hesitate to book, you will love it! We had a fabulous time! The owners were super kind and professionals, they took amazing care of us. From taking us to pick fresh eggs in the morning, to supplying with freshly-picked salad and coal for our bbqs! They were always available for any question or problem. The location is superb, surrounded by rolling hills and farms. There are a couple of big supermarkets minutes away (including a Lidle) and there are lots of things to do in the areas nearby like the zoo, castles and a lovely pebble beach (50 mins away by car). The pool and the Jacuzzi were obviously a great success with our children but so were the play area outside and the chicken and bunnies grazing in the garden. Absolutely fantastic! We had four days over the Easter break in the gite and all of us had a wonderful time. Celine and Cyril were excellent hosts and allowed our four year son to feed the chickens and collect the eggs. The scrambled eggs were delicious for breakfast. They also loaned him a bicycle which we enjoyed watching him ride up and down the Avenue Verte situated 50yards from the gite. The facilities were comfortable and the pool and spa area were fabulous. We would come back to this gite as all five of us left feeling extremely relaxed. Super week-end, accueille nickel et le gîte en lui même est très propre super content. La piscine et je jacuzzi sont parfait !! Comme c'est agréable de pouvoir se baigner ou se détendre dans la pièce avec la piscine et le jacuzzi. Très bon accueil avec de petites attentions et également durant le séjour. Très beau coin à visiter. - 50 m of Green Avenue: pedestrian path, bicycle path linking Dieppe to Forges waters, about forty kilometers, green avenue is also the starting point for other excursions including to the forests near Eu and Eawy ... ..